Unfortunately, Medicaid (MaineCare) does not include coverage for nutrition services, under any circumstances. The number of visits, co-pays and deductibles vary from plan to plan. We suggest you call the member services number on your insurance card to determine your coverage. Although we are more than happy to discuss insurance with you when you make your appointment, it is your responsibility to be familiar with the details of your insurance plan. *Because insurance policies vary so greatly in their coverage of medical nutrition therapy, even from one contract year to the next, it is important you understand our participation with your insurance company is NOT a guarantee of coverage. Likewise, be aware that your physician’s referral is NOT a guarantee of coverage. Q. Which local employers have health insurance that covers counseling at Nutrition Works? A. 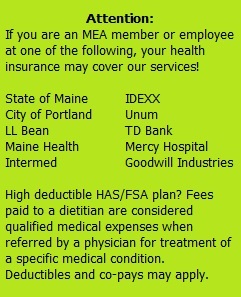 Most employees with coverage through the following employers are covered for nutrition services at this time: MEA, State of Maine, City of Portland, Unum, LL Bean, TD Bank, IDEXX, Maine Health, Mercy Hospital, Intermed, and Goodwill Industries. Co-pays and deductibles may apply. Call the member benefits number on your insurance card to be certain; some employers on this list offer multiple health insurance options, and coverage for nutrition services may vary. Q. Why doesn’t my plan cover nutrition services, even though my doctor referred me? A. Your covered benefits are listed in a contract negotiated between your “group” (usually your employer) and the insurance company. These negotiations usually take place annually, so covered benefits can change from year to year. Employers who recognize that nutrition care promotes a healthier and more productive work force make sure that nutrition services are included. Q. What should I do if my plan doesn’t cover nutrition services? A. Make sure you speak with the HR benefit specialist at your workplace to let them know that you want nutrition services included in your health insurance plan. If there is demand from employees, perhaps it will be a priority during the next year’s negotiations. If you have a health care spending account (HSA) you can use it to pay for nutrition counseling at Nutrition Works (check the terms of your HSA to be sure). If you pay out-of-pocket for our our services, we accept cash, checks, MasterCard and VISA.